Having begun studying textiles and ceramics in Norway, Margit Seland completed her studies at the Gerrit Rietveld Academy in Amsterdam, where she founded her design studio in 2000. Inspired by the household objects of yesteryear, natural materials such as stone and wood, and the natural contrasts of rough and smooth, warm and cool, she works on the border between design and craftsmanship. Margit’s products include tableware in porcelain, glass and textiles, as well as felt and sailcloth bags and sculptural pieces for exhibitions. In addition to producing her own small-series ranges for galleries, she frequently works on commissions from companies such as Royal Delft. 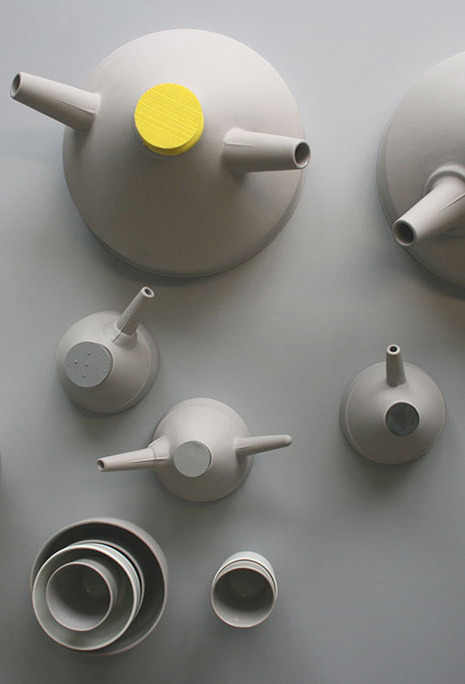 Tuthanka is a series of porcelain decanters, cups and bowls in white and dyed earth tones. The shape and material of he sanded matte exteriors and smooth transparent-glazed interiors create a textural contrast – most evident in the cups, which have a partial glaze on the outside. The decanters are each cast in a three-part mould – body, spout and handle – which are then assembled afterwards.